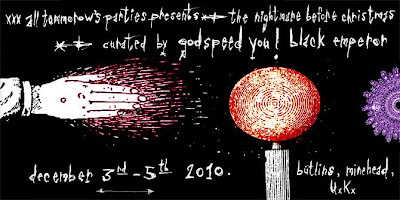 To conclude the yearlong celebrations of 10 Years of ATP, it was recently announced that GODSPEED YOU! 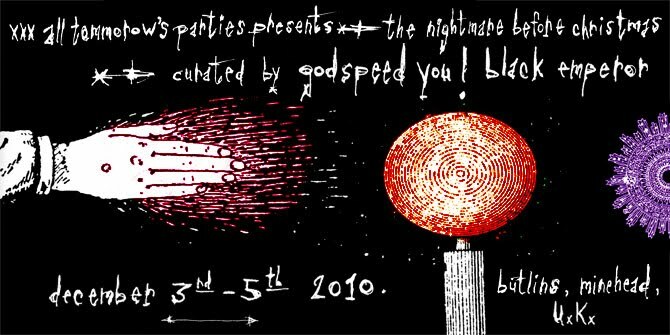 BLACK EMPEROR will be the curators of our Weekend 1 Nightmare Before Christmas festival. NEUROSIS is honored to be performing at the Nightmare Before Christmas festival. The weekend will run from the 3rd-5th December at Butlins Holiday Centre, Minehead featuring around 40 bands picked by Godspeed You! Black Emperor, who will also perform. GODSPEED YOU! BLACK EMPEROR / NEUROSIS / BARDO POND / THE EX / DEERHOOF / THE DEAD C / BLACK DICE / FRANCISCO LOPEZ / TIM HECKER / MIKE WATT / SCOUT NIBLETT / far more to be confirmed! There is a limited batch of early bird tickets at a £10 per person discount available until Friday 23rd April (unless they run out first).